"Just wait. Your mother will make you into somebody. You'll be the envy of everyone." Poet, essayist, novelist, political commentator, screenwriter, and finally, filmmaker: Pier Paolo Pasolini is one of the key figures of post-war Italy's intellectual and artistic scenes. Born in 1922 to a petit-bourgeois family in the Friulian region, northeast of Venice, he had already gained some degree of success for his literary works when he moved to Rome in 1950. In the following decades, he would be acclaimed and honored�and also scorned and derided, at least in part because of his very public prosecutions on charges of "indecency" resulting from his sexual encounters with young men. Pasolini was fascinated by the borgate, the desolate outlying suburbs of Rome and home to the poorest of the poor, the "sub-proletariat" as he called them. In some sense, he saw the inhabitants of the borgate as pure and untainted by consumerist society, and both of his first two films feature characters and plotlines drawn from that milieu. So strong was Pasolini's attraction to the borgate that he discovered many of the actors in his early films there, and his love of language led him to use the Italian dialects typical of those areas for many of his characters. Accattone and Mamma Roma are two variations on a theme, that of a member of sub-proletariat's desperate attempts to better him or herself. In the case of Accattone, the eponymous main character (Franco Citti) tries to stop pimping and take up theft (seen as relatively respectable), but is inexorably drawn back into his former lifestyle. In Mamma Roma, the title character (Anna Magnani) leaves her life of prostitution, taking her estranged 16-year-old son, Ettore (Ettore Garofalo), to live with her in a new apartment. She's purchased a license to sell produce at a market stall, and has visions of not only bettering herself, but Ettore as well, finding him a job as a waiter, though by devious means. Her past life comes crashing in, both physically in the person of her former pimp Carmine (Franco Citti), and psychologically, as Ettore learns of her former profession and loses interest in his half-hearted attempts at respectability. After World War II, the greatest influence on Italy's intellectual left was Marxist theory and analysis. Although a Communist himself, Pasolini was never one to toe the party line. He was greatly concerned with his position as an intellectual and artist within a political movement that was directed towards the working class, and struggled with the dominant Marxist aesthetic theories of the time. Influenced mainly by Hungarian philosopher Gyorgy Luk�cs, the Left favored positive portrayals of the wholesome masses struggling valiantly against their social and economic circumstances, and had no time for Pasolini's supposedly "decadent" characters. Concerned not only that his films gave a negative impression of the working class, but also that the implied fatalism of his plots would subvert the possibility of social improvement, they roundly attacked him on both an artistic and personal level. Right-wing critics were little better, criticizing Pasolini for depicting a lower-class milieu whose existence they would have preferred to forget. Pasolini was also attacked for his visual style. Although these two films have much in common with the post-war neo-realist films�location shooting, use of non-professional actors (with the notable exception of Anna Magnani), and a depiction of the working class—Pasolini's mise-en-sc�ne and camerawork share nothing of the so-called transparent reality demanded by neo-realism. Influenced by his love of painting of the Middle Ages and early Renaissance, Pasolini favors frontal shots, frequently long close-ups, with a shallow depth of field, isolating his characters from their surroundings. In Accattone, the title character is often filmed against blank white walls, and Mamma Roma takes a late-night stroll, sharply illuminated against a night-time background, interrupted only occasionally as acquaintances join her. His painterly influences are often made even more explicit. In Mamma Roma, the opening scene of a wedding celebration resembles The Last Supper, and in its closing scenes, the camera pans repeatedly over Ettore, who has been strapped down in a near-crucifix shape, each shot ending in a near-duplication of Andrea Mantegna's 15th-century painting, Dead Christ. After Mamma Roma, Pasolini abandoned the borgate. Disillusioned by the working classes' absorption into consumerist society and questioning his own ability to effect political change, he made several films that examined his place as an artist in society, and later moved into explorations of myth, eroticism, and epic form. He would continue to struggle with the contradictions in his personal and professional lives up until his untimely death at the hands of a street hustler in 1975, leaving behind a fascinating body of work that still resonates today. Image Transfer Review: The digitally-restored image is quite good. The contrast level seems a bit high, but that's the look Pasolini and cinematographer Tonino Delli Colli were going for, so the transfer can't be faulted for that reason. There's a lot of detail, and in many scenes, the black-and-white photography is gorgeous. Occasional exterior scenes seem washed out and somewhat soft. Grain is minimal and there are no compression artifacts. Audio Transfer Review: The mono audio is fine for a film of its vintage. There's no hiss, and no stridency or harshness to the soundtrack, and dialogue is at all times clear. Extras Review: Most welcome is Criterion's inclusion of La Ricotta, Pasolini's contribution to the 1963 omnibus film RoGoPaG, so named after its four directors, Rossellini, Godard, Pasolini and Gregoretti. While its story is slight (a film extra in undone by his own greed), it's a key film in understanding Pasolini's thematic and stylistic shifts from his first two films to his later works. Pasolini was condemned for contempt of religion for this film, but it's actually more about perceptions of Catholicism and its reception in contemporary society. A corpulent Orson Welles stars as a director who's filming the life of Christ, in which Stracci (Mario Cipriani) is playing an extra. Stracci is desperate for food, but once he finds what he's looking for, overindulges to the point of death, echoing Pasolini's growing discontentment with a working class that he saw as increasingly buying into capitalist consumerism. Pasolini also takes potshots at himself, in the person of the distant, intellectual director, isolated from the spontaneous antics of his cast and crew, a self-described "archaic Catholic." The 1.85 anamorphic transfer is problematic, with variable contrast and jerky movement, and may have been taken from an interlaced source, but this is the best it has looked on home video. The documentary Pier Paolo Pasolini is an excellent introduction to the artist and his work. Over the course of its 58 minutes, Pasolini's film career is covered chronologically, using lengthy excerpts from most of his films, and each of these is placed in its context within Pasolini's shifting interests and artistic concerns. There are interesting interview clips with Pasolini himself, as well as a rather fanciful interpretation of Pasolini's homosexuality by Italian author Nico Naldini. Unfortunately, the documentary is taken from a videotape source, and the image is soft, with bad black levels and chroma bleeding. The 6m:30s interview with renowned director Bernardo Bertolucci, who worked with Pasolini on Accattone, is interesting, with comments about the reception of Mamma Roma, its structure, and Pasolini's influence on Bertolucci's career. Tonino Delli Colli, cinematographer on many of Pasolini's films, discusses how the look of Mamma Roma was achieved, Pasolini's preference for non-professional actors, and the difficulties of working with Anna Magnani, in his 8m:57s interview. Finally, Pasolini biographer Enzo Siciliano has 9m:16s to talk about Pasolini's shift from novelist to filmmaker, his visual style and his use of dialect. The interview segments are punctuated with production stills, posters, and clips. The poster gallery includes nine posters for Mamma Roma, three for RoGoPaG, and one Polish poster for a Pasolini retrospective. They're presented effectively, with closeups of interesting details. The trailer is full of speckles and somewhat soft, but looks fairly good, and is interesting for Pasolini's voice-over comments, in which he describes the controversy surrounding the film. The 32-page booklet includes an analysis of Mamma Roma and La Ricotta by Gary Indiana, interesting interviews with Pasolini from Oswald Stack's 1969 book Pasolini on Pasolini, and a brief excerpt on La Ricotta from Enzo Siciliano's biography. In short, Criterion has favored us with an excellent selection of extras, both for those new to his films, and those long-time enthusiasts who wish to delve more deeply into two of his works. Pier Paolo Pasolini's second film, Mamma Roma, makes a welcome appearance on DVD. 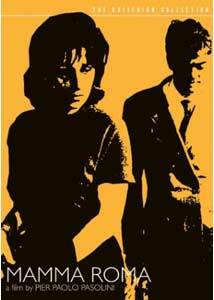 It's an interesting variation on post-war neo-realism, filtered through Pasolini's thematic and stylistic concerns. The transfer is good, and Criterion provides their usual great selection of extras, including the short film La Ricotta, a key work in Pasolini's oeuvre.